I was Lucky enough to receive a Mary Kay makeup box full of goodies bestowed upon me from Influenster. If you aren't familiar with this site, it is basically a place that rewards you for giving your opinion of past and upcoming products. The good the bad and the lovely. They want to know it all. In return you earn badges for doing different tasks that aren't boring! Then those badges earn you a specific voxbox to try for FREE. I have gotten some amazing and not so amazing products from Influenster and this box had just that. I loved some things and was not a fan of others. I'm always excited to give my honest opinion, as I know every box will have something redeemable. you can't really ask for more when it's free! The presentation of this package was lovely and I love the sleek black packaging! This brush is pretty stiff, but very soft. I cannot stand or use rough brushes, so I was happy with this brush. It's comparable to nice drugstore brands, but a bit pricey. Eh, this blush brush is very rough for something that is supposed to be used on your face. I would never take this near my sensitive skin. 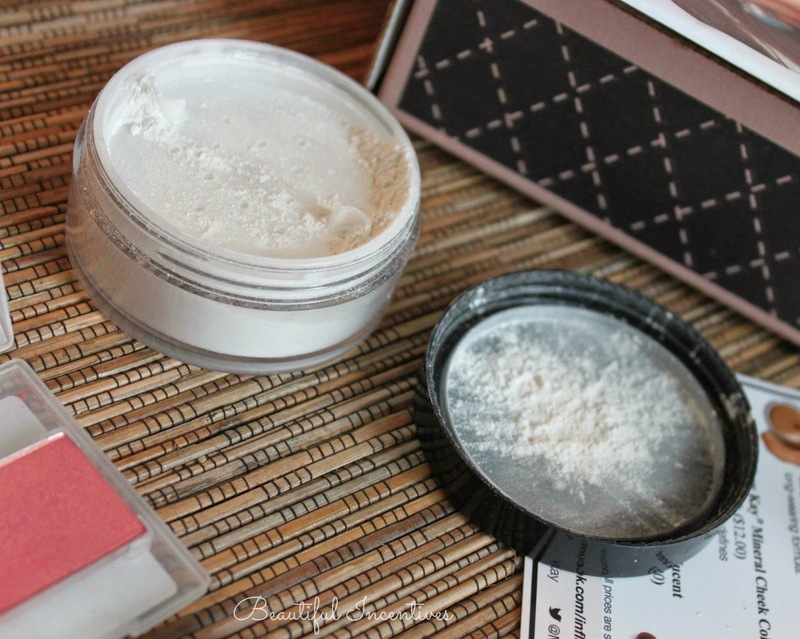 It may be good for dusting some powder on the body, but that's about it. It doesn't feel good at all. I would not recommend. 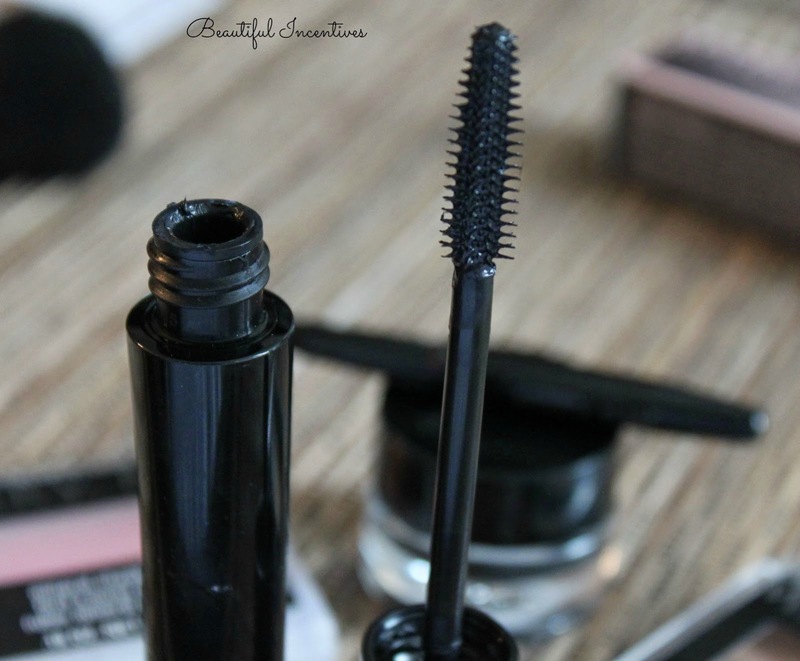 I have to say, the mascara went on clumpy the first round, but I found that if I went a lot lighter upon application, it lessened the clumps significantly. With one application, I had pretty lengthy lashes that DO resemble spider legs. The second layer added the thickness and volume. It dries relatively FAST so I found that I had to do a quick careful 2 swipes and I was good to go. I'm a fan, and the black is a gorgeous true jet black. This stuff is impressive. I am beginning to like gel eyeliner more and more. 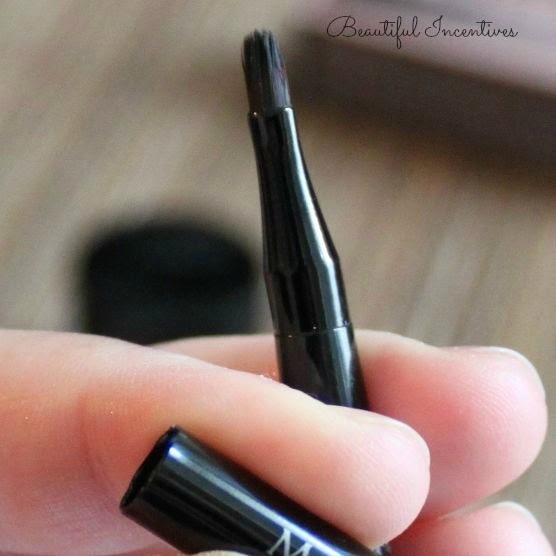 The trick to easy application is a really good brush. This brush was a bit too thick for me, but some may love that. The consistency is nice and it glided on like a dream. The applicator is too cute. Perfect for travel. You can see the pay off of this eye liner in my pics. This has claims to control shine and I can vouch that It did help. I wasn't as shiny as I normally am and it keeps you very matte. It is fine in consistency, which is very important to avoid cakiness and makes it very smooth to apply . I love it to set my foundation and I found it's perfect for setting my under eye concealer. It has a slight white cast though, so not exactly transparent. I think you'll see what I mean from the swatches. That doesn't bother me, b/c I'm pale to begin with. It also has a very slight shimmer, which looks nice under the eyes. Nothing bad that accentuates wrinkles. It's quite messy, so you have to swirl the brush in it a little at a time in the cap. Not a big fan of lip glosses. They are too sticky for my liking. I achieve my shine through emmollient lip balms. For those of you who like them, this has a lot of shine and this color is a bold orange red. This soft creamy long wearing Eye color has a nice sheen and a pretty accurate color name. It does reminds me of apricots. It looks like a true apricot. A warm peach color. See the swatch for more detail. It's nicely pigmented, which is a common occurrence in Mary Kay products as you'll see in the swatches. 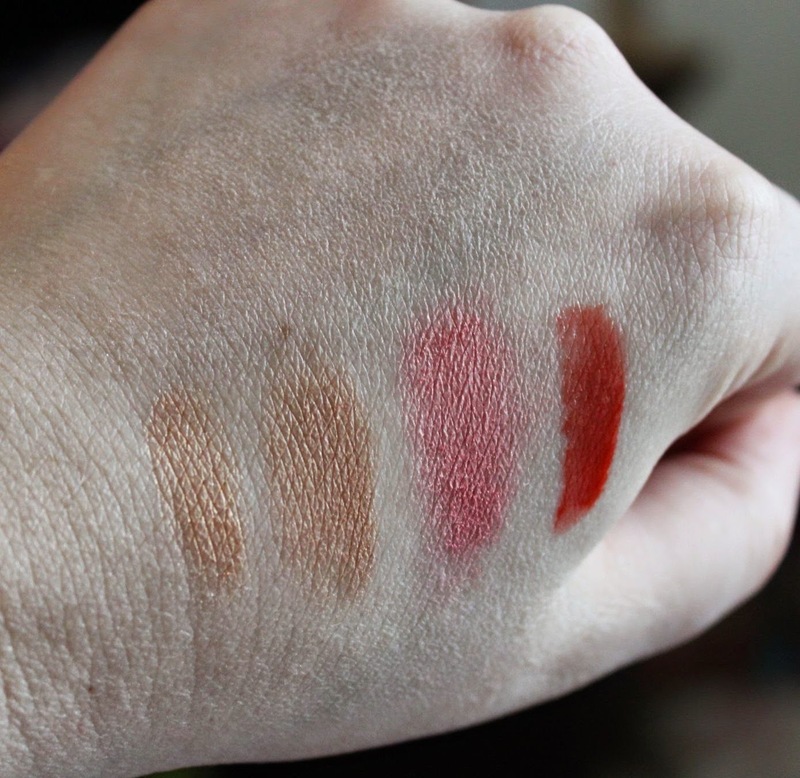 Swatches left to right; apricot cream shadow, bronzer, blush and lip gloss. The translucent is swatched up top. Can you see what I mean by the white cast and sheen? This Bronzing powder wasn't bad. Not at all orangey like a lot are! This was a nice tan and well pigmented. I'm not a huge fan of bronzer, but I have been experimenting with contouring and this works for that. It has a sheen to it. Not matte at all, but I like that just as much as matte. I like to use it very lightly on my cheeks. This color is meant for light to medium complexions. I really adore this cheek color, like all the other products, the pigment is impressive. The color is a peachy pink hue and I'm wearing it in the pics. It goes on very light, which I like. I don't need my blushes bright. I like to build my color. Over all, Some of the items pleasantly surprised me and others were very lack luster. 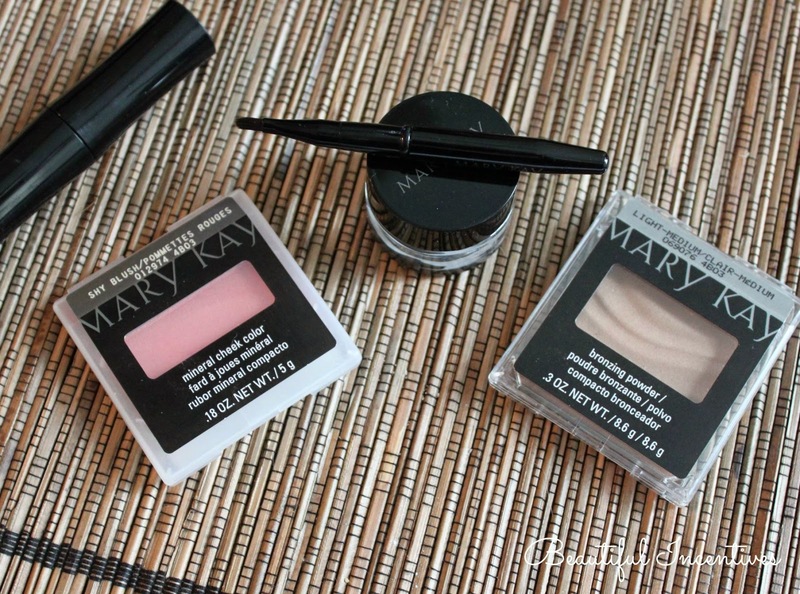 I'm really not impressed with the brushes, but Mary Kay redeemed themselves with the other great products. I would probably repurchase, the gel liner, translucent powder, blush, and possibly the mascara, but the price is again a bit high for me. I like that this package was made of a minimum of 30% recyclable materials and they use biodegradable peanuts. It's a start at reducing their carbon footprint. 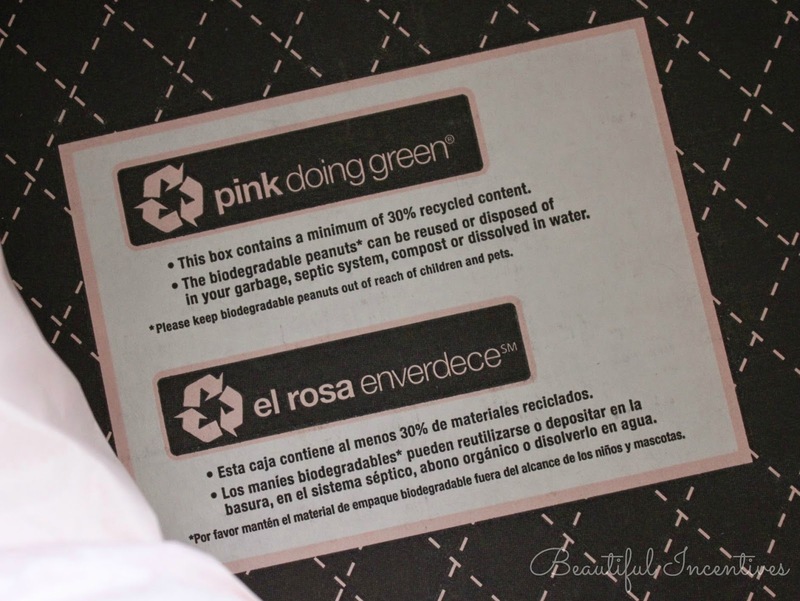 HUGE thank you to Influenster for the opportunity to review these products! If you'd like to get your own boxes, the only way to get in is by supply your e-mail so I can send you an e-vite! So e-mail me if you want in! Very nice review...I love your honesty!